“According to new research led by Michigan State University and published in the current issue of Childhood Obesity, when schools offered snacks in lunchtime a la carte or vending that were mostly or entirely healthful, students responded with improvements in their diets, said Katherine Alaimo, MSU associate professor of food, science and human nutrition. 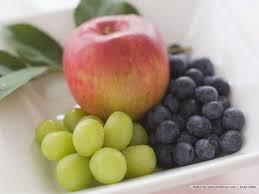 The U.S. Department of Agriculture will ask schools to implement its Smart Snacks nutrition standards on July 1, 2014. Those recommendations will set limits on calories, salt, sugar and fat in foods and beverages, as well as promote snack foods with more whole grains, low-fat dairy, fruits and vegetables. Alaimo and her team of researchers tested standards similar to the USDA’s new requirements and demonstrated that Smart Snacks has the potential to improve students’ eating habits. For example, schools that started healthful snacks in lunchtime a la carte or vending programs boosted their students’ overall daily consumption of fruit by 26 percent, vegetables by 14 percent and whole grains by 30 percent. Students also increased their consumption of fiber, calcium, and vitamins A and C.
For the study, researchers also compared schools that adopted a variety of nutrition programs and policies. Some schools made only limited changes, while others implemented more comprehensive programs to assess and improve the school’s nutrition environment. Changes schools made included raising nutrition standards for snacks and beverages, offering taste tests of healthful foods and beverages to students, marketing healthful foods in school and removing advertisements of unhealthful foods. When schools implemented three or more new nutrition practices or policies, students’ overall diets improved. “Creating school environments where the healthy choice is the easy choice allows students to practice lessons learned in the classroom and form good habits at an early age, laying a foundation for a healthy future,” said Shannon Carney Oleksyk, contributing author and healthy living adviser for Blue Cross Blue Shield of Michigan. 2 Responses to "Making Healthy Choices for School Lunches"